From the Archive: On Dec. 20, 1989, President George H.W. Bush ordered the invasion of Panama to arrest Gen. Manuel Noriega on drug charges. 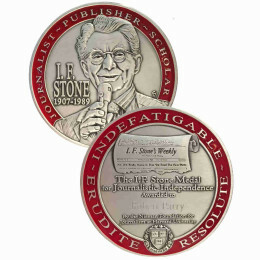 The U.S. news media viewed the assault as a case of Bush seeking justice, but there was a darker back story of U.S. guilt, as Robert Parry reported in 1997. On the afternoon of Oct. 2, 1987, John F. Molina, a 46-year-old Cuban with the look of a Latin Sean Connery, sauntered from the stylish Panama City offices of the law firm, Sucre y Sucre. Molina and his companion, Enrique Delvalle, had been clearing up business that they had with lawyers who had created shell corporations for an arms supply network for the Nicaraguan Contra rebels. The two men stepped out onto the busy street and climbed into Molina’s red Mitsubishi four-wheel-drive vehicle. Without their noticing, a young bushy-haired man with a moustache darted toward the car. The young man raised a .32-caliber pistol, pointed it at Molina’s head and fired three times. Molina slumped across the front seat. For a moment, Delvalle thought Molina was reaching toward the opposite side door. Then, Delvalle realized that John Molina was dead. Vice President George H.W. 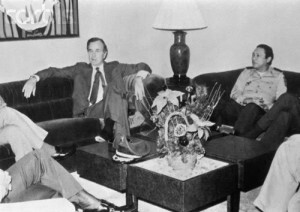 Bush meets with Panamanian Gen. Manuel Noriega in 1983 as Noriega was being recruited to aid Nicaraguan Contra rebels, in line with President Ronald Reagan’s secret policies. Bush served as CIA director in 1976. In the following days, La Republica, a newspaper allied with then-dictator Manuel Noriega, played up the drug angle — and Molina’s ties to Noriega’s political enemies in the Cruzada Civilista. The newspaper also noted that in the 1970s, Molina was president of UniBank, or the Union de Bancos, the Panamanian outpost for the WFC Corp., a shadowy money-laundering network earlier known as World Finance Corporation and run by Miami-based Cuban-Americans with close ties to the CIA. To this day, the mystery of the Arms Supermarket’s money is one of the most intriguing unanswered questions of the Iran-Contra scandal. But the Molina case shed new light as well into another dark corner of the Reagan administration’s Contra war: how, in a variety of cases, the funding for that covert operation was closely tied not only to guns-for-drugs — as has been alleged for years — but to the even-murkier world of drug money-laundering. Since the mid-1980s, drug pilots and other cocaine-cartel operatives have asserted that Contras assisted in transhipping cocaine to the United States in exchange for money and guns, or that cartel kingpins contributed cash to the Contras to curry favor with the Reagan administration. The Drug Enforcement Administration also failed to respond to repeated requests about the late John Molina. A senior government official, however, confirmed that Molina’s name was mentioned in a number of DEA criminal files, including some cases that were still under investigation in the late 1990s. According to a Contra-supply flow chart that I obtained from Independent Counsel Lawrence Walsh’s Iran-Contra records at the National Archives, the Arms Supermarket was part of a complex arms network ultimately reporting to former CIA officer Felix Rodriguez, an anti-Castro Cuban who used the pseudonym “Max Gomez.” Through Rodriguez, the arms network connected to the office of then-Vice President George H.W. Bush. “The ‘Arms Warehouse’ was started with ‘seed money’ of approximately $14 million, from the CIA,” read the text accompanying the flow chart. “Later, it was believed that funds relating to narcotics traffic found its way into inventory in the warehouse.” Although the authorship of the flow chart is unclear, it matches information supplied to investigators by another Contra arms broker, Barbara Studley, who worked closely with retired Gen. John K. Singlaub. In a telephone interview, Ronald Martin, the Arms Supermarket’s principal owner, vehemently denied any drug connection and denounced the charge as a lie spread by North and other business rivals who wanted to horn in on Contra arms profits. “All they were trying to do was taint us and push us out of any business that might be forthcoming,” Martin said. But Martin acknowledged that Molina did arrange the Arms Supermarket’s money through banks in Panama. Martin also would not say exactly who put up the money. 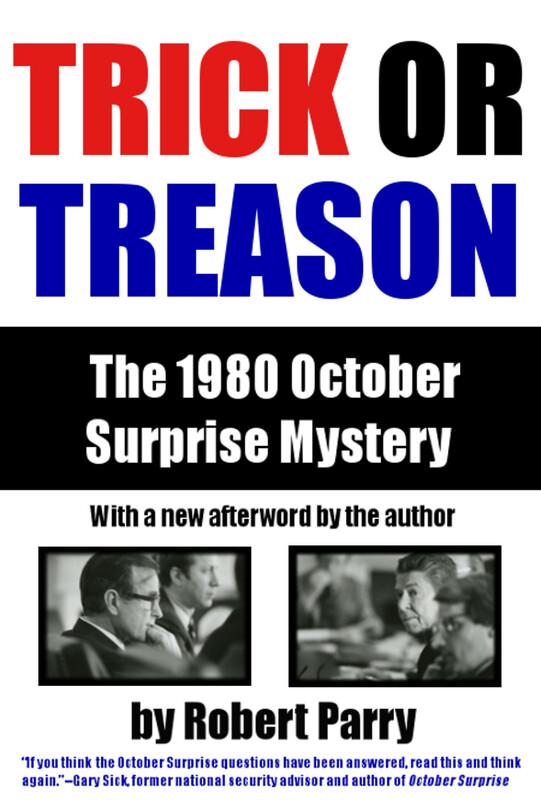 During the official Iran-Contra investigations, these drug suspicions were never resolved. 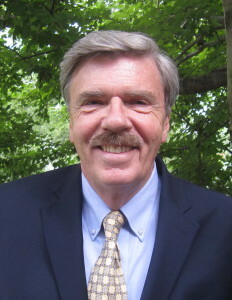 William Hassler, a lawyer who handled the issue for Independent Counsel Walsh, explained that the Martin group was not a focus of the Iran-Contra probe. “I’m not sure we considered it a part of our investigation,” Hassler explained. So, the suspicions about the Arms Supermarket remained hazy. But Molina’s use of Panamanian banks as the source of funds for the Contra weapons and his own connection to the world of drug-money laundering gave a concrete form to the suspicions for the first time. On Zucker’s orders, Morabia tapped into a money-laundering operation controlled by her husband in New York City. Her husband and son then delivered bags filled with hundreds of thousands of dollars to North’s operatives in New York hotel rooms. Sometimes, to cap off these amateurish spy operations, North’s men first would be required to display matching halves of torn dollar bills. At the European end of this money-laundering scheme, Zucker made equivalent transfers from North’s Swiss bank accounts (containing profits from U.S. arms sales to Iran) into the Swiss accounts of the money-launderers. That way, the money-launderers could turn their “dirty” money in the United States into “clean” money in Europe. Morabia, who was granted immunity from prosecution in exchange for her cooperation with the Iran-Contra investigation, acknowledged that the so-called “cash drops” were designed to circumvent federal currency laws. Those anti-money-laundering statutes require federal reporting of any cash transfer of $10,000 or more into or out of the United States. Iran-Contra Independent Counsel Walsh described these “cash drops” in a brief section of his final report in 1993. Walsh said the cash transfers through Zucker’s operation totaled $2.7 million. Similarly, Walsh’s probe found that another $467,000 went in bags from Southern Air Transport’s petty cash fund in Miami to pay salaries and buy gas for North’s Contra air re-supply operations based at El Salvador’s Ilopango airport. SAT, a onetime CIA-owned airline, was then reimbursed through money transfers from North’s Swiss accounts, Walsh report stated. However, the later discovery of documents gave a more sinister cast to the SAT-Ilopango operation. As North’s pilots were carrying those bags of cash from Miami, a female FBI informant was alleging, in September 1986, that she had witnessed cocaine being loaded aboard SAT planes in Barranquilla, Colombia, in 1983 and 1985. The woman, Wanda Palacio, identified a North pilot, Wallace “Buzz” Sawyer, as one crew member loading drugs onto a Barranquilla flight in early October 1985. Ronald Reagan’s Justice Department spurned Palacio’s testimony as lacking credibility. But Sawyer’s flight logs — recovered after Sawyer was killed in the crash of an Oliver North supply plane over Nicaragua on Oct. 5, 1986 — corroborated Palacio’s claim that Sawyer was in Barranquilla in early October 1985 flying an SAT cargo plane. The Palacio allegations suggest that participants in North’s Contra resupply operations were trafficking in drugs and possibly using the secret government operation as a cover to “clean” their money. The Reagan administration’s collaboration with alleged drug traffickers and money-launderers also was far from isolated. In 1986, the Reagan administration paid $806,401 to four companies to supply the Contras with non-lethal aid despite documentary evidence of drug trafficking by all four companies. One of the Contra contractors, a Costa Rican seafood company called Frigorificos de Punterennas, was created as a cover for drug-money laundering, according to sworn testimony by two of the firm’s principals, Carlos Soto and Ramon Milian Rodriguez. Still, in 1986, the State Department put $261,937 into a Frigorificos bank account controlled by Cuban-American Luis Rodriguez. A year later, Rodriguez was charged in federal court as a major marijuana smuggler. The State Department has never explained how the four money-laundering companies were selected, although Ambassador Robert Duemling who oversaw Contra “humanitarian” aid recalled that North wanted continuation of “the existing arrangements of the resistance movement,” the Contras. In one 1989 memo, Castillo summarized his findings, which implicated a half dozen pilots and other drug smugglers who were associated with the Contra network at El Salvador’s Ilopango military airport. In addition, Castillo’s memo on drug trafficking implicated senior Salvadoran Air Force officers who protected North’s secret Contra operation and sold fuel to North’s pilots.